Variations of this article appear in the February 7 edition of the Ham & High and the Camden New Journal. Members of the Camden Swiss Cottage Swimming Club made an excellent start to the new year by competing at the 2019 Middlesex County Youth and Age Group Swimming Championships. The competition was held as a short course (25m pool) event over 2 weekends for swimmers aged 10-13 at the Southbury Leisure Centre in Enfield and as a long course event (50m pool) over one weekend for those aged 14 and above at the London Aquatics Centre in Stratford. At the youth competition, 19 year old Ally Larson made her presence known in her final County Championships before heading off to Northwestern University next fall. She competed in 6 events, winning every single event. She walked away with an astounding 6 over-all best trophies that encompassed the 200m & 400m Individual Medley, the 100m & 200m Butterfly, and the 100m & 200m Freestyle events. Donatas Dragasius, aged 15, won 3 gold medals in the 200m Individual Medley, 200m Backstroke, and the 1500m Freestyle. He then added 3 silver medals to his collection in the 400m Freestyle, 50m & 100m Backstroke and then a bronze medal in the 400m Individual Medley. 14 year old Ella McEver also took home 3 gold medals winning the 50m Breaststroke and the 200m & 400m Individual Medleys. She matched those wins with 3 silver medals in the 100m Butterfly and the 100m & 200m Breaststroke. Brandon Biss (14), Leo He (14), and Alexis Lambropoulos (15) each took home 2 gold medals to add to the Camden Swiss Cottage medal haul. Brandon won the 100m & 200m Backstroke, finishing second in the 400m & 1500m Freestyle, and finishing third in the 400m Individual Medley. Leo, who had the most youth medals for CSCSC, won the 50m Freestyle and the 200m Butterfly while taking second in the 100m Freestyle and the 50m & 100m Butterfly. He also added 2 third place finishes in the 200m Freestyle and the 200m Individual Medley. Alexis finished top of the podium in the 200m & 400m Freestyle events while taking third in the 100m Freestyle. Other gold medals were received by Yann Divet (16) taking gold in the gruelling 1500m Freestyle while adding silver in the 800m Freestyle and bronze in the 400m Individual Medley. Oliver Wright (14) took gold in the 50m Breaststroke while also taking silver in the 100 Breaststroke and a bronze in the 200m Breaststroke. Para-swimmers Leah O’Connell (17) and Charlie Hyde (17) each finished with a gold medal. Leah took gold in the 200m Individual Medley and Charlie took her gold in the 400m Freestyle. Silver medals were won by Antoine Divet (14) in 50m Freestyle, Emilia Magliocco (14) in 50m Backstroke, Edie McGrath (14) in 200m Butterfly, Anna Podurgiel (17) in 50m Butterfly, 100m Freestyle, and 200m Individual Medley, Georgie Winters in 50m Freestyle, and Grace Wylie in 100m Backstroke. Antoine also took bronze medals in the 50m Butterfly and the 100m Freestyle while Emilia took a bronze in the 200m Backstroke. Edie also took a bronze in the 400m Freestyle and Anna finished off her spectacular weekend with a bronze in the 50m Freestyle. Grace also finished third in the 200m Backstroke and teammate Georgie finished third in the 200m Freestyle. Those that took home bronze medals included Lauren Brantley, Alex Chen, Will Chen, Jacob Cohen, Nathalie Lustig, Jackson Olin, and Alex Pama. The age group competition in Enfield proved to be a talent showcase for 11 year old Ines Guimond-Beetham and 12 year old Ava Lambropoulos. Ines took home 5 gold medals for wins in the 100m & 200m Butterfly and 100m, 200m, & 400m Freestyle. She also took silver in the 50m Butterfly, 200m Individual Medley, and bronze medals in the 100m Individual Medley and 200m Backstroke. Ava, who took home the most over all medals for CSCSC (10), finished with 4 golds in 100m Butterfly, 800m Freestyle, and 200m & 400m Individual Medley. She also finished with 6 silver medals in the 100m Individual Medley, 50m & 200m Butterfly, 200m & 400m Freestyle, and 100m Backstroke. 12 year old Lucas Bohm had an excellent championship of his own by winning all the Breaststrokes (50-100-200), finishing second in the 50m Freestyle and 100m Individual Medley, and finishing third in the 200m Individual Medley. Silver medals went to Nick Finch (13) in the 50m & 100m Butterfly and Nik Markov (12) in the 800m Freestyle. Bronze medals went to Damian Miceta (12) by finishing third in all the Breaststrokes. Other third place finishes included Erin Andrews (12) in the 800m Freestyle, Charlotte Shaw (13) in 1500m Freestyle, and Ksenia Shchepovskikh (11) who finished third in the 100m Breaststroke. Camden Swiss Cottage also showed its overall depth in team events by winning the boys 12 year old 200m Freestyle Relay & the 200m Medley Relay. The 12 year old girls proved just as fast by winning their 200m Freestyle & 200m Medley Relays as well. The girls 10-11 team contributed by winning the 200m Freestyle Relay and finishing second in the 200m Medley Relay. 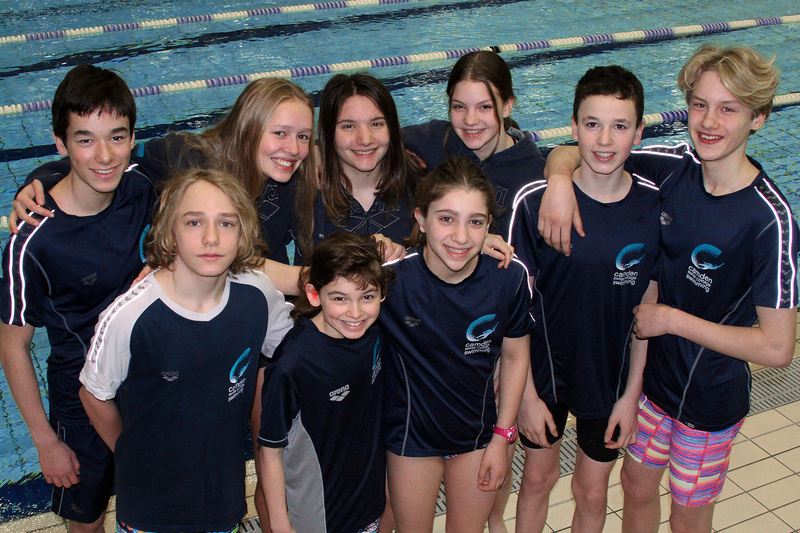 Overall, the Camden Swiss Cottage Swimmers proved a force to be reckoned with at the County Championships by winning over one hundred individual medals. They now focus their attention towards the London Swimming Regional Championships in May.